A US government delegation has been invited to Scotland in a bid to overturn its 40-year ban on haggis. Rural Affairs Secretary Richard Lochhead's invitation comes two days ahead of Burns Night, when suppers are held in honour of poet Robert Burns. Imported haggis was banned by the US because its food standards agency prohibits sheep lungs in food products. Mr Lochhead raised the issue with the US last year but said he was still hopeful that imports would resume. 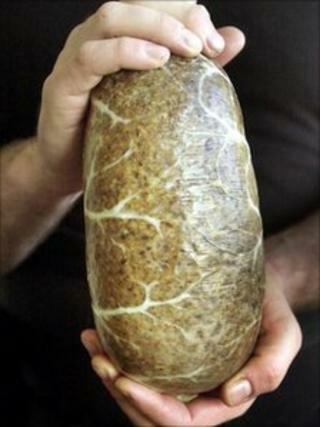 Traditional Scottish haggis, which is made with a sheep's heart, liver and lungs, had faced a double barrier. In addition to the sheep's lung ban, the US prohibited the use of offal from the UK in the wake of the BSE outbreak in 1989. However, the US ban on British meat products in the wake of the BSE crisis has since been relaxed. Mr Lochhead said the US was a "potentially lucrative market" that could be worth "millions" to Scottish haggis producers. He added: "We want to capitalise on the diaspora of Scots in the US and many of them would enjoy the opportunity to indulge in authentic Scottish haggis to accompany their neeps and tatties on Burns night. "Scotland's produce is amongst the best in the world and I've asked US Department of Agriculture officials to come here to see for themselves the high standards we have in animal health and processing. "This will help them realise that our haggis is produced to the highest standards and that it's time to allow imports to resume." Edinburgh-based haggis producers, Macsween, said the impact of any decision to reverse the US ban would be enormous. Director Jo Macsween added: "In our experience, American visitors love our haggis when they taste it while in Scotland and it would be lovely if they could not only be permitted to take some home with them at the end of their stay here, but purchase it in America too. "Of course, we would love to do business in America as we know we have so many fans there."